[DURHAM] Two north Carolina congressmen who represent parts of Durham allege that agents with the US Immigration and Customs Enforcement Agency (ICE) lied to a Mexican immigrant who was living at a local church, convincing him that he should leave the church, and travel to Morrisville in order to deal with his ordered deportation. When the man, Samuel Oliver-Bruno, left the church, Friday, he was arrested by ICE, and taken away. In a statement, Congressmen David Price [D-NC-4] and G. K. Butterfield [D-NC-1] noted that Bruno had been living in the United States for over 20 years, and had been following the law per his legal petition. He had back come to the US because his wife was ill, and son depended on him. [RALEIGH] The current Wake Register of Deeds calls it, “ …hubris incarnate., manifested audacity laced with temerity.” But former Wake Register of deeds, Laura Riddick, maintains that even though she is now a convicted felon, having pled guilty in August to stealing nearly $1 million from her public office over a seven year period, and spending it on lavish trips, she is still entitled to her full pension, and resents having to forfeit over $120,000 of her pension in the process. Riddick is suing the state Treasurer’s Office to retain her pension. [WASHINGTON, D.C.] Former NC Dept. of Transportation Secretary Anthony Tata – who is also a retired brigadier general - defended Pres. Donald Trump’s ordering 5200 military troops to the Mexican border to repel Honduran refugees seeking asylum in the United States from crossing the border. ON “Fox and Friends” on Sunday, Tata was asked his reaction. “President Trump is a man of his word, he said he was going to be tough on the border and he is tough on the border,” Tata replied. Later that afternoon on Twitter, Trump thanked Tata for his support. Tata, who once endorsed Sarah Palin for president, served as NC Transportation Secretary under Gov. Pat McCrory for two years. DR. BARBER MAKES A POINT DURING REMARKS AR PROTEST OUTSIDE OF THR NC LEGISLATIVE BUILDING TUESDAY, AS NCNAACP PRES. REV. 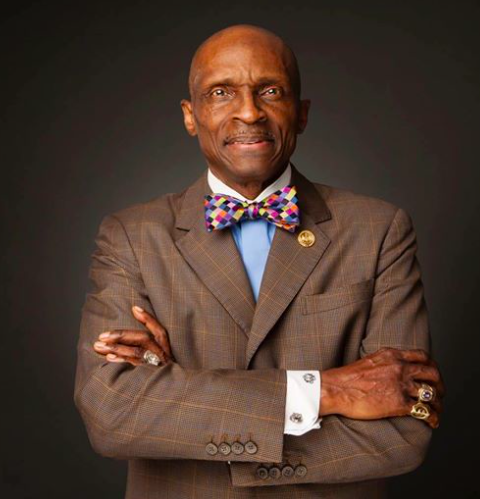 DR. T. ANTHONY SPEARMAN APPROVES. As the NC General Assembly reconvened in yet another special session Tuesday, two prominent North Carolina civil rights leaders warned to not to trust any new laws establishing photo voter identification emanating from it, despite a constitutional amendment passed by voters recently mandating it. “Don’t you compromise on our rights [Democrats],” warned Rev. 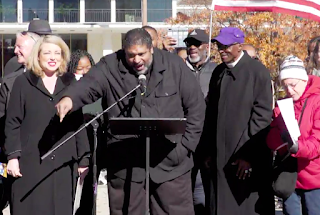 Dr. William Barber, president of Repairers of the breach, and co-chairman of the Poor People’s Campaign: A National Call for Revival, during a protest demonstration across the street from the Legislative Building on Jones Street in Raleigh Tuesday. Barber, like several other speakers there, called the NC General Assembly “unconstitutionally constituted” because the federal courts have ruled that they were previously elected by unconstitutionally racially gerrymandered voting districts. “They cheated,” Barber summed up. Barber added that even though voters approved the voter ID amendment to the North Carolina Constitution, that means little if it contradicts the federal Constitution. The same elected officials who vote for voter ID in the South, are the same, Dr. Barber said, who vote against women, expanding health care, living wages, labor rights, public education, the LGBQ community, and immigrants. Like other speakers on program, Rev. Barber also warned that lawmakers should be devoting most of the estimated two weeks this special session is expected to take towards helping flood victims still recovering from the devastation of Hurricane Florence. “We are drifting back towards Jim Crow, Rev. Dr. T. Anthony Spearman, president of the NCNAACP told the crowd, accusing the Republican-led NC General Assembly of “…intentionally disenfranchising voters of color to ensure political gain…” for white supremacists. “Every time the Berger-Moore all-white caucus comes up with a trick to disenfranchise our rights, we will use it to make North Carolina bulletproof against the voter suppression tricks of the white caucus, the NCNAACP leader vowed. At press time Tuesday, neither chamber of the NC General Assembly had passed any voter ID legislation. Senate President pro-tem Phil Berger told reporters Monday that lawmakers would take their time with passage, seeking input from Democrats and citizens. Tentatively, the Republican majority wants voter ID legislation that allows for college identification to be used, in addition to driver licenses and free ID cards issued by the state Dept. of Motor Vehicles. With strong signals that the Republican-led US Senate may very well vote to confirm President Trump’s re-nomination of Raleigh attorney Thomas Farr, 64, to the federal bench as early as today, everyone from progressive activists like the NC NAACP, to the Congressional Black Caucus, to North Carolina ‘s Democratic Congressional Delegation, have mobilized to stop the vote. Two busloads of NCNAACP activists from across North Carolina, led by state conference president Rev. Dr. T. Anthony Spearman, traveled to Washington, D.C. Wednesday to lobby senators on Capital Hill to either vote against Farr’s controversial judicial nomination to the U.S. District Court for the Eastern District of North Carolina, or let the nomination die with this outgoing Congress. Farr was already approved ten months ago by the Senate Judiciary Committee, but concerned about the midterm elections, Trump pulled the nomination temporarily. Now that the elections are over, observers expect Sen. McConnell to try to get as many of Trump’s judicial nominees confirmed as possible, with Farr heading the list. What makes Farr’s nomination to the lifetime post so controversial is his documented history as an election campaign attorney for the late conservative U.S. Senator Jesse Helm (R-NC) during the 1990’s. Farr is alleged to have helped engineer a Republican so-called “ballot security” program in 1990 that attempted to suppress the black vote statewide when Helms was first challenged by black candidate, former Charlotte Mayor Harvey Gantt. In addition, all three of North Carolina’s Democratic congresspeople – Alma Adams (13th(, David Price (4th) and G.K. Butterfield (1st) – wrote a letter to Senate Majority Leader Mitch McConnell (R-Kty) Monday asking him to “cancel all votes” on the Farr nomination and “allow his nomination to expire in the 115thCongress…” because of troubling questions about Farr’s alleged racial past. The Eastern District of North Carolina is comprised of 44 out of the state’s 100 counties, and has had the nation’s longest judicial vacancy. But even though district also has a black population of over 25 percent, it has never had a black judge. In fact, Pres. Obama nominated two black female candidates for the post before he left office, but North Carolina’s Republican U.S. Sen. Richard Burr ‘blue slipped’ or blocked the nominations from getting Senate consideration. 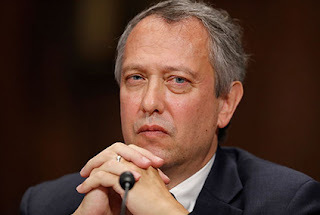 Allowing Farr to become a federal judge, not only because of his history with Helms, but his later efforts on behalf of the NC Republican Party to establish voter ID and racial gerrymandering, would be unthinkable, says Dr. Spearman. “Tom Farr in the Eastern District with the legal authority to decide the fate of African-Americans — hear me somebody — is tantamount to Adolf Hitler wreaking havoc among our Jewish sisters and brothers, and Saul, who later became the apostle Paul, breathing out cruelty to Christians,”Spearman told reporters last March after going to Washington to protest after Pres. Trump first nominated Farr. On Tuesday, a number of national civil rights leaders, including former North Carolina NAACP Pres. Rev. William Barber, joined the Congressional Black Caucus and the North Carolina Democratic Congressional Delegation in calling for the U.S. Senate not to confirm atty Thomas Farr.